Seeing disfigured trees like this is upsetting to say the least! 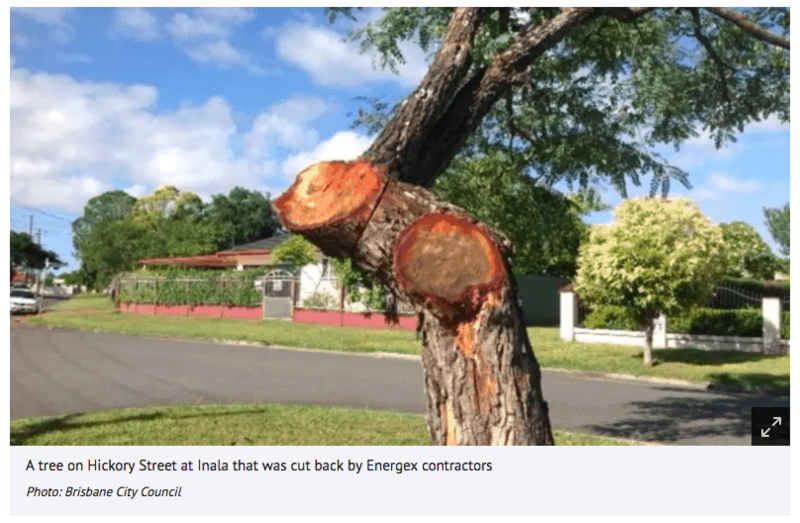 The Energex contractors are just working to clearance parameters set by Energex and the tree pruning work is carried out with little regard for the trees. 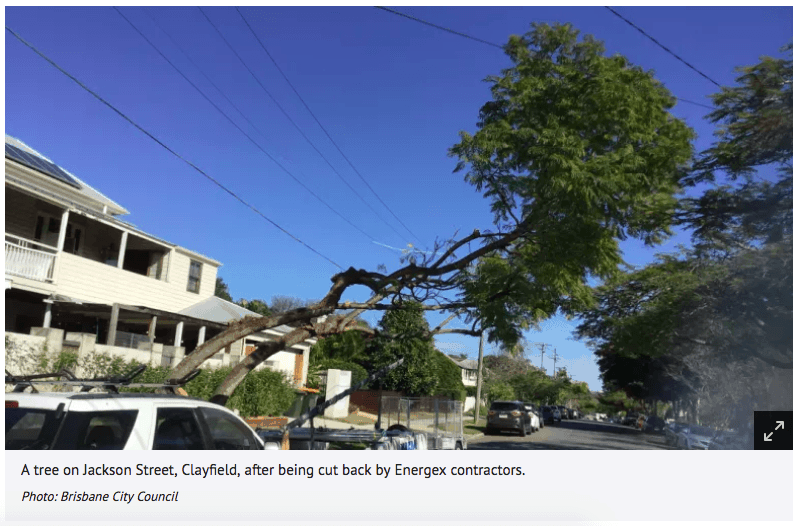 Trees that are left unbalanced or on extreme leans are at a much greater risks of either completely uprooting or limbs failure during strong wind events. Pruning of branches that exceed 150mm diameter will cause stress to the tree and leave it vulnerable to attack from pathogens in the form or harmful fungi or bacteria along with the myriad of pests that take advantage in attacking trees while they are weak and lacking the energy reserves to defend themselves. Pruning more than 20% of the leafy material in any 12 month period will also leave the tree vulnerable and is not in accordance with Australian Standards AS4373 Pruning of Amenity Trees (2007). Cutting the top out of a tree and leaving the tree in a ‘V” shape will also compromise the structural integrity of the tree, not to mention how unsightly they look. 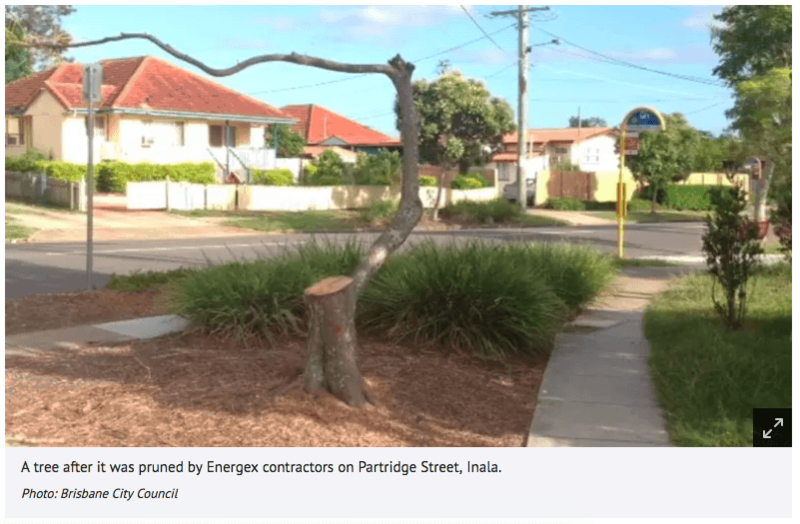 The Energex contractors have an important job to do, but as a Level 5 Consulting Arborist with 11 years experience and a TRAQ (Tree Risk Assessment Qualified) Arborist with the International Society of Arboriculture, in my professional opinion trees that are going to be left in the above mentioned states should instead be removed entirely and replaced with much smaller growing trees and shrubs that reach maximum heights well below the power lines. Planting a tree species that can potentially grow to be 20m+ tall underneath an 8m high power line is insanity and this practice should stop immediately. You don’t need to be a tree lopper to see that these trees are in bad shape. They’re unsightly and are a risk to everyone’s safety. We deserve better than this! This is why you need to trust only qualified, experienced tree professionals. Tree removals, lopping, pruning and stump grinding is not a simple hack job. Don’t risk life, limb or property. Talk to North Brisbane Trees on 07 3289 2610 today and see why we’er the only tree experts for the job.